People often ask, “what is the new trend?”; the answer nowadays is, any style that suits your dream look! Yes, that is right, as you see in social media, you can have from rainbow hair to the classic 50’s pin curled hairstyle. 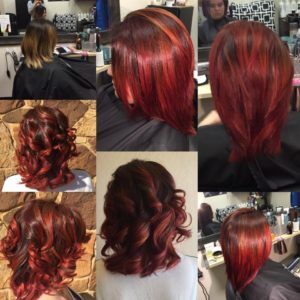 The array of options means that it gives clients more creative freedom to achieve the hairstyle or hair color they want, as well as interact more with their stylists on making decisions. It is not just about what’s the “in” hairstyle or hair color, expectations are evolving to new artistic heights. Have you ever been scared or nervous about wearing certain hairstyles? Good news, this feeling is normal! Believe it or not, even hairstylist can feel the same way, but the answer to our fears is knowing the proper way how to manage our hairdo. So, the best thing to do is consult with your hairstylist and settle your fears or concerns. 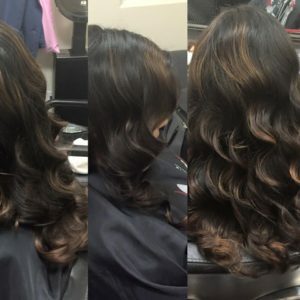 Here are some questions you may want to know the answer to, “how often do I need to go to the hair salon to maintain this look?”, “what is the process in the salon (including chemical process, and/or time it takes to perform the service)?”, “what styling products would I need”, and finally “how can I maintain my hair at home?”. The bottom line is, the more information you know, the more satisfied you will feel about your decision. There are many different highlights; bayalage, ombre, foil, cap, and foilage highlights. Each type of highlights show different visually because they are all done with different techniques. 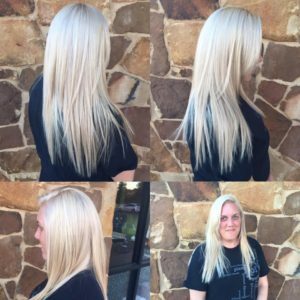 Bringing in a picture of the type of highlights you want is the best way for your hair stylist to know what your looking for! Below is a brief description of each kind of highlights. retouching the highlights don’t appear as crucial. This type of highlighting is ideal for individuals who are low maintenance. Foil, cotton or seran wrap are often used to separate the sections of hair with color. 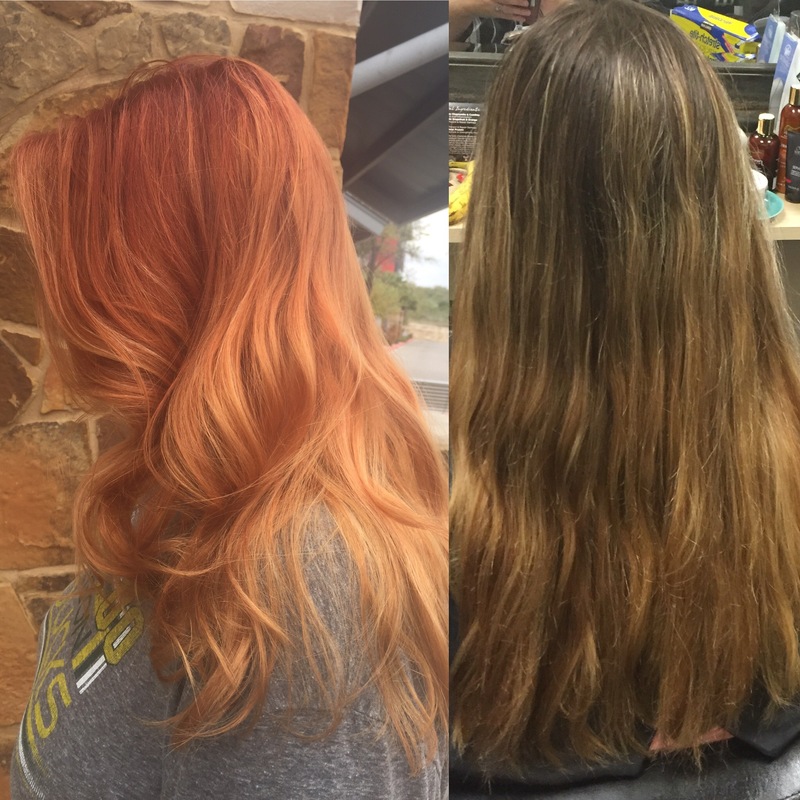 The highlight streaks in the hair can range from heavy to thin. 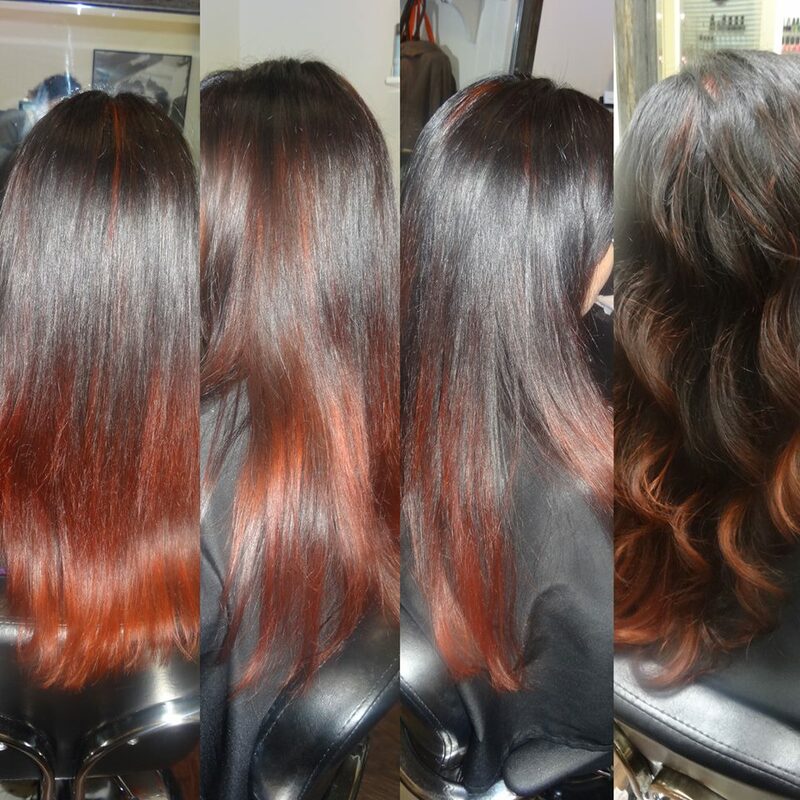 Ombre- Either bleach or hair color is purposefully applied to the ends of the hair. The hair product is also feathered -like bayalage- or teased in the hair, to create no hard lines. Therefore this hairstyles is low maintenance because its already at the ends of the hair. Ombre would eventually get cut off from the ends of the hair. Foil or seran wrap are often used to separate the sections of hair with color. 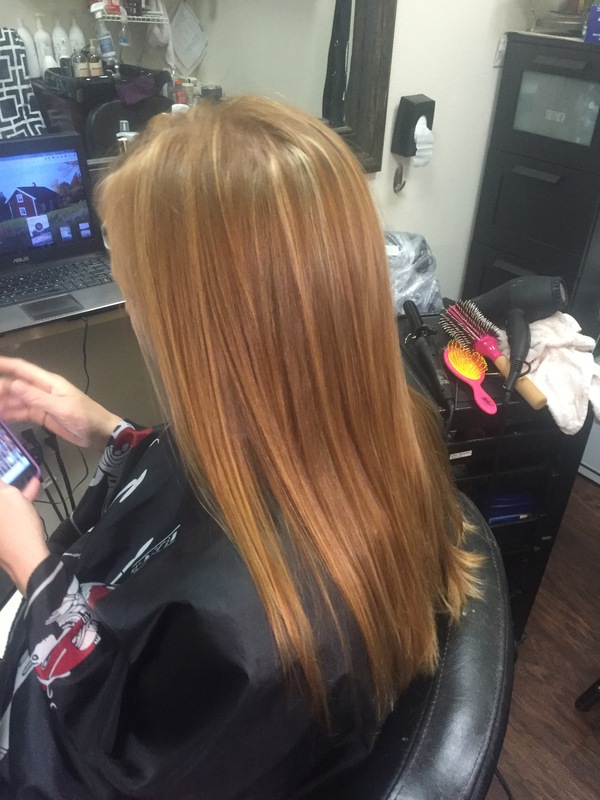 The highlight streaks in the hair can range from heavy to thin. Foil- Foil sheets are applied close to the scalp with sections of hair and bleach or hair color inside. The sections of hair in the foil can be thin or thick or even a combination of both. 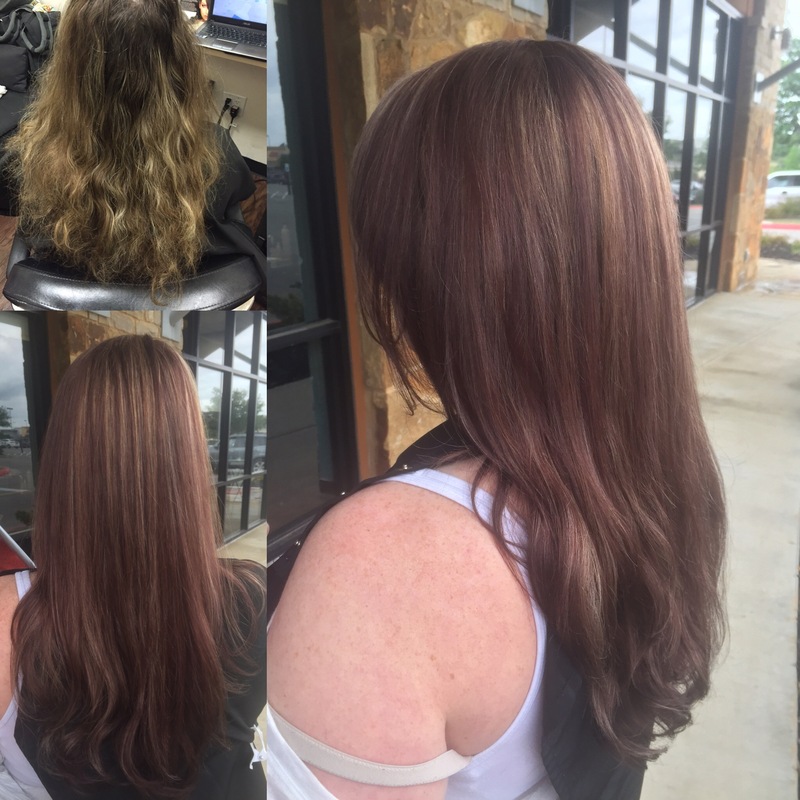 The hair color is applied about 1/4 inch away from the scalp, so as the highlights grow out, you will notice hard lines (a line of demarcation) where the highlights began from the scalp. This type of highlighting is high maintenance, touch ups are recommended every 6-8 weeks. Cap– A cap with holes all around the cap, is placed on the person’s head, and the hairstylist will gently poke a pick with a hook on the end through the holes and the hook will grab strands of hair through the cap. Caps are mostly used for short hair, because long hair can get tangled and it is not easily pulled through the cap. 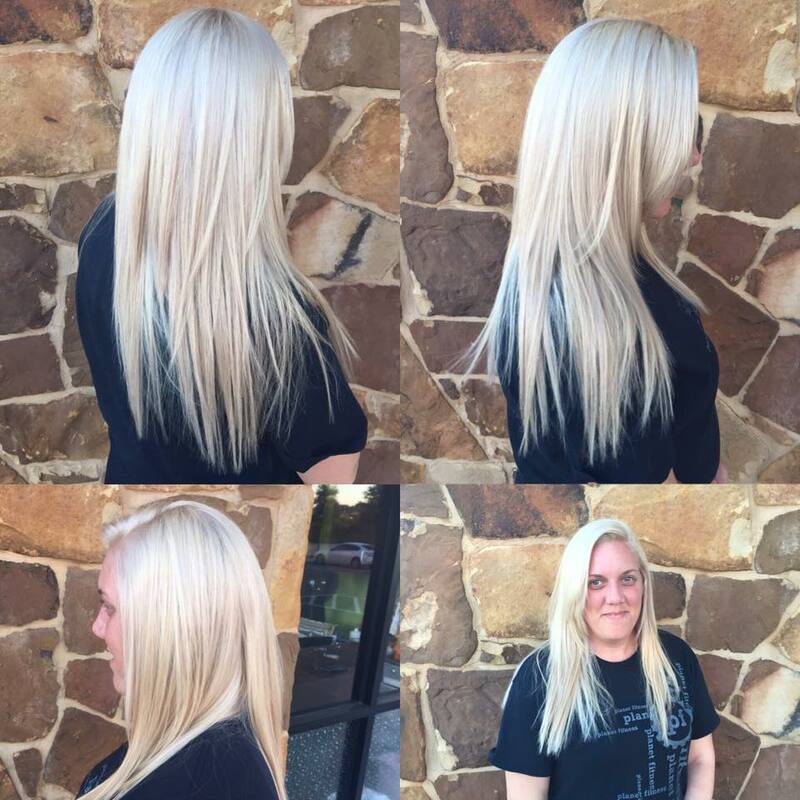 To maintain these highlights, retouches are recommended every 6-8 weeks. It is considered a high maintenance hairstyle. Foilage– A combination of the bayalage technique and foils are applied to the hair. For further description please read ‘bayalage’ and ‘foils’ above. Do you want some hair around the face (fringe) to be dangling down? 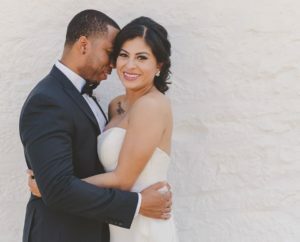 If so, you may want to ask your stylist to cut a face-frame or bangs, so the hair’s short enough to hold a curl or will softly lay to the side. Do you have a picture of the updo your wanting? 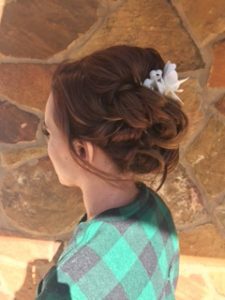 The best thing to do is send your stylist a picture before your appointment, so your stylist can prep you on what you may need to achieve that look ( hair extensions, hair fillers, etc), how long it could take to perform the updo, and how the veil -if there is one- will fit. Should you wash your hair the day before? I usually recommend for my clients to come for their appointment with dry/clean hair. I use products, like hairspray and hair paste, to gather the fly-ways. If the hair is oily, you or your stylist can spray dry shampoo to soak up the oil before hair styling. Are you worried about if your hair will hold a curl? This is a common concern, I will address the uncontrolled and controlled situations. 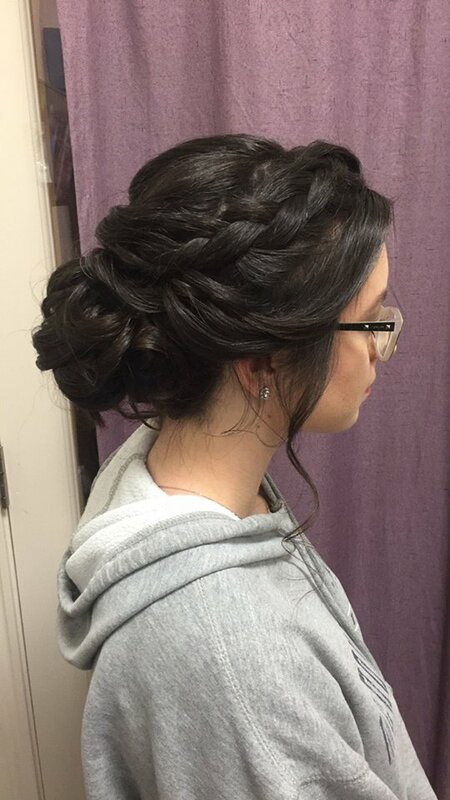 First the uncontrolled, if the event is outside and there is high humidity or hot temperatures outside, You may want to consider doing an updo that will have some hold with tighter curls or hair that is partially or all pinned up. 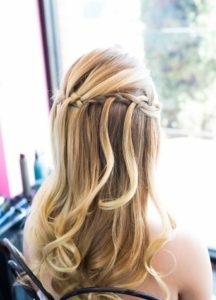 You don’t necessarily have to have your hair all up, it’s just advised to keep an eye on the weather and inform your stylist about what style will work best. There are ways to wear the hair down and maintain the look. What if I have curly hair? 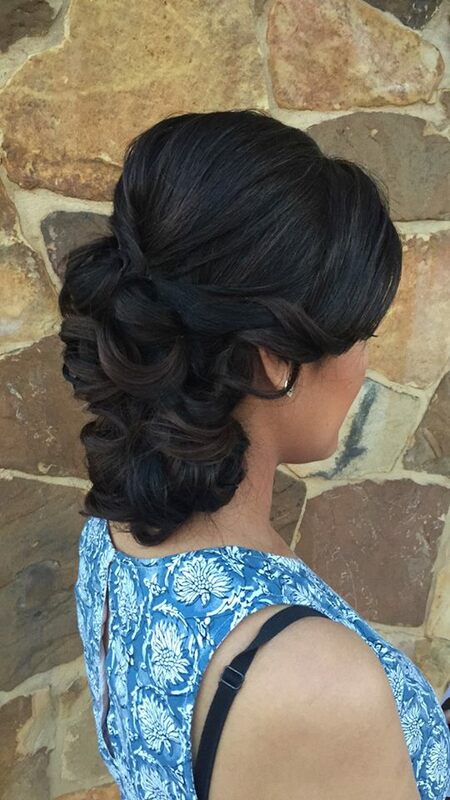 Unless you want to use your curls in the updo, i recommend making a separate appointment with your stylist to straighten or blow-dry your hair. Adding a flat-iron/blow-dry service, in most cases, is an additional cost and adds more time to your service. Its important to consult with your hairstylist to help you prep for the updo. Your special day should be filled with joy and hopefully having the proper information to plan for your big day can make it much more stress free! When picking a haircut you like, keep in mind that everyone has a different combination of facial features, hair texture (fine, medium coarse, coarse), curl pattern (if the hair is not straight), and head/neck structure that are not the same as the next person. A haircut is not a one size fits all kind of deal. Haircuts vary in form and texture. That is why someone can look good with heavy bangs with no fringe, but not a light wispy bang and a tapered fringe. The most important part is to consult with your hairstylist. Each hairstylist has their own work style. Some hairstylists ask you throughout the haircut, the amount of hair you would like to cut off or the type of hair cutting technique they think would work best, others may just style your hair based on a picture or a brief description of what your wanting and not ask many questions. Clients are the same way, there are clients that don’t like to be asked many questions about their haircut and prefer to let the hairstylist decide for them. Then there are those that would rather know what their stylist is doing and keep that communication open. I would recommend for your next haircut appointment, to either bring a picture ( it does speak for words unspoken), describe the amount of hair you want cut off, or give your hairstylist creative freedom to recommend which hairstyles suites you! Any of these choices are not right or wrong, it’s just your style of how you’d like to communicate with your hairstylist! 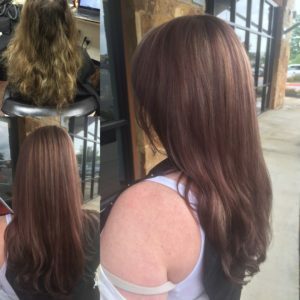 Application/ Removal– Hair extensions last 21/2 – 3 months. 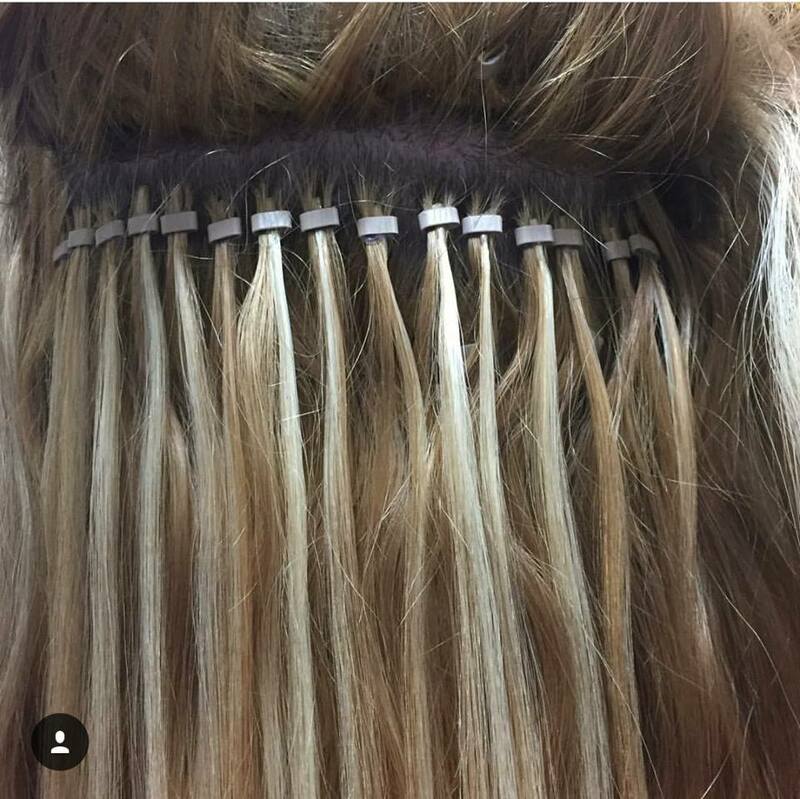 This is when your hair extensions grow out with your natural hair further away from your scalp.The hair extensions can be removed by your hair stylist and applied back on your hair, 1/4 inch away from your scalp. Maintenance- Its important not to yank on your hair extensions, as it puts strain on your actual hair. Brushing your hair between 1-2 times a day, it helps keep your hair from tangling and the extensions in good condition. You want to shampoo your scalp gently to cleanse and manipulate your blood flow, the conditioner is to be applied away from where your hair interlocks with the hair extensions (mid-shaft to ends). Do you want extra length to your hair? Do you feel you want a fuller hairstyle? Hair extensions are great for that! If your having a hard time deciding which type of hair extensions you want, here’s a break down. Tape-in hair extensions– are 2 strips (about 11/2 inch wide) of hair strips that have a sticky tape adhesive on one side of each strip. 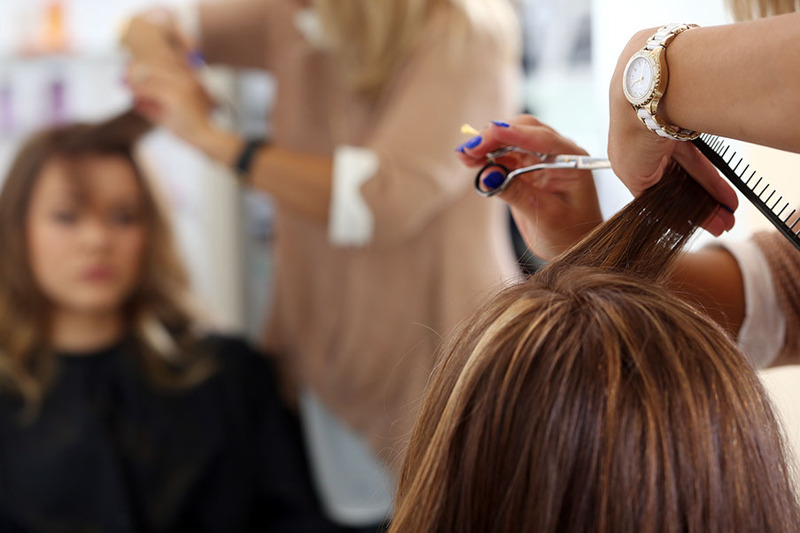 Your stylist will section out your hair, away from your hairline (so the extensions are not visible) and place thin subsections of hair (thickness of a credit card) in between the 2 strips of hair extensions. This process is repeated through out the head. I-tip hair extensions– a bundle of hair is sold with hair strands glued together at one end. 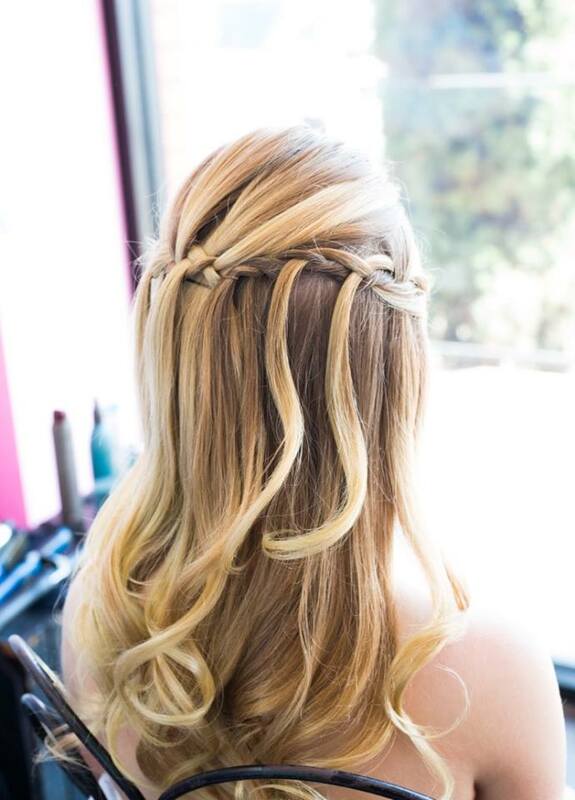 Both tiny section of your hair and the hair extension is clamped together through a ring, close to your scalp. This process is done throughout the head and can take 1 – 3 hrs, depending on how much hair is needed. Sew-in hair extensions– natural hair is cornrowed to the scalp through out the head, then weaves of hair extensions are sewn onto the corn rows through out the head.